← The American Bride! Scandal, Disguises and Romance! Miss Darcy is Appalled! The American Bride! Romance? Pshaw! Miss Darcy quizzed one of the Daughters of Sweet’s Racing Club (DSRC), Alicia Weathersfield, who revealed the titillating rumor about her ancestor, Lord Wilton. Miss Darcy was able to ferret out the fact that he had gotten himself into quite a coil (disturbance or fuss) through the machinations of his grandmother, the Duchess of Landglower. A proxy marriage was arranged between Wilton and, of all people, an American girl. What a corkbrained (idiotic) proposition! What good can come of such a misalliance? Downton Abbey devotees would tell you an American bride wed to an English lord does not lead to financial salvation! The book The American Bride tells a rousing tale of the bride’s escapades on her arrival in England. And what a doozy it is! “Nonsense, Caroline. Where’s your backbone?” the Duchess of Landglower snapped. “Impossible!” Came the adamant reply. Arms resting on her knees, hands clasped in silent supplication, she leaned toward the Duchess. 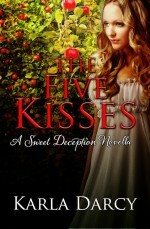 Miss Darcy is appalled that this innocent young girl might be bedded by a total stranger but what options has Cara? In Downton Abbey, the American bride did save the estate. Not the same thing here, don’t you know? Even Jane Austen would be hard pressed to wrap this story in plain linen (offer a positive spin.) Miss Darcy is well aware you can’t resist learning the rest of the story, can you? 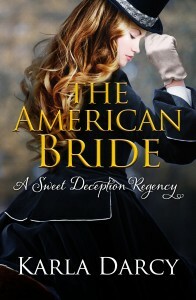 To Buy or Download a Sample of The American Bride Click HERE. PS: The best way to keep in touch with Miss Darcy is to subscribe to her mailing list. She’ll send you opportunities to download free books and pre-publication announcement offers for members only. And of course, as your faithful correspondent, Miss Darcy will make you privy (share the knowledge of a secret) to any news items worthy of her attention. Subscribe HERE.